This bill (HR #3312) needs to be defeated, and with your help, I think we can. .... It isn&apos;t. It simply throws $700 million to pro-abortion organizations. And they already get plenty. "But wait!" They&apos;ll say. "This isn&apos;t funding abortions." Sure it is, it&apos;s funding abortion providers. Their argument islike saying a piece of legislation doesn&apos;t fund drinking, it funds bars. You know, because plenty of people go to bars to access the valuable nutritional content of pub food, so we&apos;re just giving money to the bars so they can put on more happy hours. I will provide information about HR #3312 and why it is important to defeat it. If you scroll to the bottom of the post you will find action items to make sure that itis defeated. Please link to this post if you are convinced. Let&apos;s get a lot of people involved on this one. HR #3312 in summary reads: "To provide for programs that reduce the number of unplanned pregnancies, reduce the need for abortion, help women bear healthy children, and support new parents." It is currently in committee, and is waiting to get to the floor of the House to be voted upon. Tim Ryan (D-OH) sponsored the bill, along with 12 other democrats, notably Rosa DeLauro (D-CT). The main thrust of the bill is to increase Title X funding for Planned Parenthood and other pro-abortion groups. It also mandates that Medicaid would universally cover both abortion and contraception. How much money are we talking about? As I said above, $700,000,000.00. That&apos;s right: seven hundred million dollars. If you had seven hundred million dollars dangling in front of you, and weren&apos;t scrupulous, wouldn&apos;t you think of a really clever argument to argue that you deserve it? The bill includes enough other provisions to make the excuse that it isn&apos;t another veiled attempt to pump more money into these for-profit organizations. The bill provides heavy coverage for contraception, with the argument being that this will reduce abortions. A country saturated in contraceptives, however, does not drive down the number of abortions. Efforts in the UK to increase contraception access have only resulted in the deepening of the abortion epidemic. The bill&apos;s sponsor, Tim Ryan, who is Catholic, claims to be pro-life. He is not, or at least, he never votes pro-life. He recently voted to have taxpayers in DC fund abortions. As Jack Smith writes, "In the current and last sessions of Congress Tim Ryan had the exact same voting score from National Right to Life as Rosa DeLauro - 0." Jack Smith provides more background here. Who likes this bill? Radical pro-abortion lobbies like NARAL. It&apos;s a ruthless cycle: abortion groups lobby for more money, so they can propose further legislation ... that gets them more money. Meanwhile the "powerful" pro-life movement continues to chug along on blogs, email lists, and concerned folks like you picking up the phone and sending emails to your representatives. I know, we have so much to gain, right? Anyway, when a movement runs out of ideas and arguments, they can do two things: have a hard think about their position or attempt to co-opt/shut-up the opposition. The pro-abortion lobby has chose the second option. "Faith in public life" is a good example of marginalizing pro-lifers and claiming a consensus for their position when there is not one. Some Christian pastors have come out in support of the bill, but not one Catholic priest has voiced support for it. Because faithful Catholics understand that contraception and funding abortion providers is not going to drive down the number of abortions in this country, or promote a culture of life. In fact, as I blogged about last week, the USCCB has taken the unusual step of specifically targeting this bill as unacceptable, calling it the "Planned Parenthood Economic Stimulus Package of 2009." If you are reading this far, you are probably interested in this sort of thing enough to be curious about the strategic opportunity here. In the wider picture, the DeLauro-Ryan bill is a preview of coming attractions: What DeLauro-Ryan floats as legislation, should it pass, is the type of "solution" the Obama administration will offer to the problem of abortion in White House-sponsored initiatives. In other words, Obama&apos;s long-awaited solution to the number of abortions is - not surprisingly - to further fill the coffers of the radical pro-abortion lobbyists and organizations which helped him and his associates win the White House and Congress. Sadly, it&apos;s still true in much of American politics that to find out what&apos;s happening, you have to follow the money. In this case it goes abortionists --> Obama --> abortionists (through Congress). But if this bill is defeated, we may still have the chance of proposing counter-solutions acceptable to true pro-lifers, from people who sincerely want to see the number of abortions reduced by supporting women and helping them make the right choice, which is always to protect innocent life and give it the same chance we all deserve. The most effective thing you can do is call your congressional representative and tell them simply "Vote NO on the DeLauro-Ryan bill." If they want a reason: "It funds pro-abortion organizations which already receive too much federal funding." If they want an alternative bill to support on this issue, there is one (see below). The congressional switchboard is 202-224-3121 (don&apos;t hang up if it keeps ringing, it takes time for an operator to help you, but it will happen eventually). But you can also be completely done with the call in under a minute. The staffs are courteous and are there to take calls from people like you on issues like this. You can also send a short email to your representative through this official form. Simply write the same thing and heck, give them the link to this post if they want to know why. If you want help spread the word around the web, you can refer folks to this post, join a Facebook group I created (Stop DeLauro-Ryan) or Twitter about it (I propose the hashtag #stopryan). As far as an alternative proposal, there is a good bill already in Congress, introduced by Lincoln Davis (D-TN) - HR #2035 which reads in summary: "To provide for programs that reduce abortions, help women bear healthy children, and support new parents." It is supported by Cardinal Rigali (head of USCCB pro-life) and numerous other Catholic and pro-life organizations, as Jack Smith explains. It is also bi-partisan: in the House it has 28 democrat and 12 republican co-sponsors! That&apos;s common ground, because pro-lifers can actually support it, on both sides of the aisle. 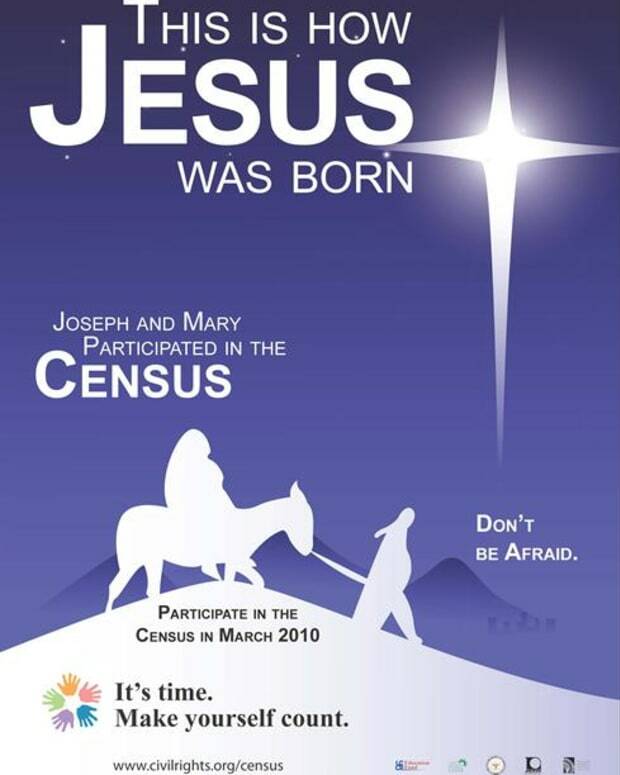 Census Poster Features Jesus; Violation of Church/State?